We donated some water to the Yea Autumn Festival today. It was a great day out and it was great to see a community letting their hair down and having a boogie to Spiderbait and Little Red. It was worth it just for the drive up there. Driving through forests of charcoal trees was mesmerising. The road to King Lake was blocked off but we had no interest in seeing too much. Seeing the Glenburn pub burnt to the ground was enough for my wife and I. We had only had a beer in there about 6 months ago. Apparently the Yea festival was almost called off because of the fires. But the good folks from the Melbourne Festival stepped in to make sure the event went ahead. If you live in Melbourne and you missed this event, make sure you get up to these areas soon and put a bit of cash into the community. 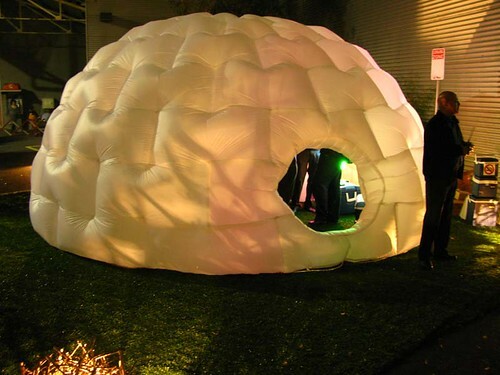 Esky is a portable blow up igloo shaped bar that has been popping up all around Melbourne as part of the Next Wave Festival. Not only is it a great spot to stop for a glass of Mountain Goat or a bottle of ABW, but they also have video screening nights. The Next Wave festival has now finished for another year, but I am sure a great idea like that will be seen around a lot more.